Most advanced and fun Facebook analytics app on the market. Check your interactions with your friends and strangers. Discover friends who checked your profile, strangers who stalk your profile, your secret admirers and who you admire most. Find out your best friends, your old friends, people who like you most and your photo interactions. You do not need to pay anything to get the full functionality. All other apps force you buy, rate or share; we don't. Just watch short videos to unlock features. Facebook followers insight: Discover your interactions, secret admirers, people you admired, your best friends, your lost friends, top likers, top commenters, interactions on your photos, most likes on photos and most comments on photos. 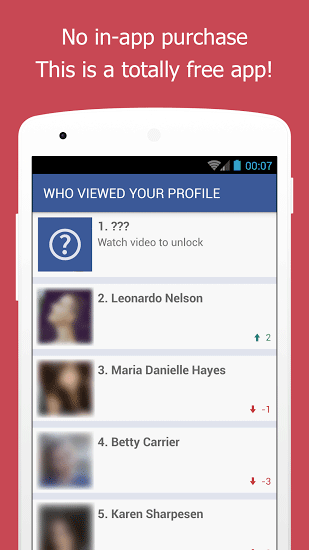 See who checked your profile. People who you have the most interactions. Find out people you interacted in old days but not anymore. Every list includes your friends as well as strangers. Strangers are the people who are not in your friends list. They may be your friends's friends (2nd degree connection), just click on their names to go to their facebook page and find out who they are. You can compare current rankings to previous ranking easily. Every list shows arrows and numbers at the bottom right of each row. Those numbers show change in ranking compared to previous analysis. For example, if person goes up from row 5 to 3, you see a green arrow with number "2"; if person goes down from row 2 to 7, you see a red arrow with number "-5". • We do not request your email address. • We never share or post anything on your Facebook™ profile. • We do not send any of your data, even your userid and name, to any remote server. All of the processing is done on your phone. 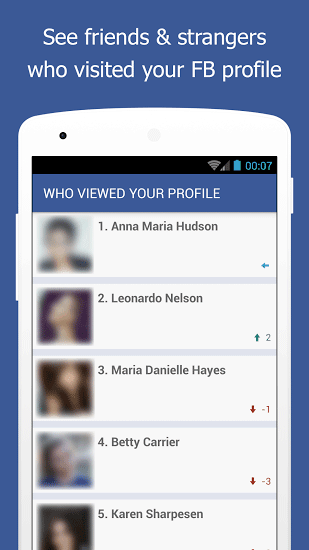 Facebook does not provide any information about people who have viewed your profile.